How quick come the reasons for approving what we like. 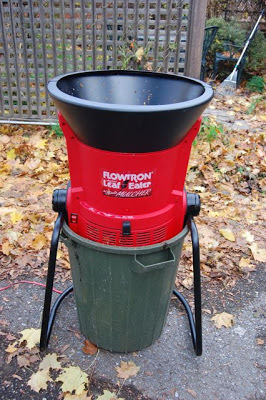 Today, I used my new purchase for the first time, and have to say the Flowtron Electric Leaf Eater pretty much (or pretty mulch) lived up to its billing: it shredded mountains of leaves, wet and dry, quickly and conveniently. 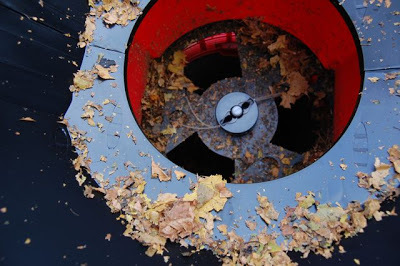 The worst thing about it was the noise, which is like an electric lawnmower or, shudder, a leaf blower – though a lot more efficient than the former at mulching leaves, and a more earth-friendly use of energy than the latter. Now that I have this neat little gadget, though, I can assure our neighbours that it won’t be running 2.5 hours at a time (albeit at intervals) again. Instead, I’ll haul it out for brief sessions. It’s lightweight enough to do that easily. When not in use, the hopper swings down between the legs of the stand. Oh, but during that 2.5 hours, Sarah and I shredded a heck of a lot of leaves… from my yard, front and back, from Sarah’s front yard, and from the front and back yard of our neighbour in between. We produced 14 garbage cans full of coarsely chopped leaves, and added them to our garden beds, right over the undigested leaves already there. I’m skeptical about Flowtron’s claims of a 30-to-1 reduction. Perhaps if we’d compressed the chopped leaves, which we didn’t, into trash bags. Still, that’s a heck of a lot of mulch. Ours are 99.9% Norway maple leaves, which we usually pile on the garden anyway. In spring, however, these full-sized leaves stratify into an ice-packed felt which can be smothering. Now, with the leaves finely chopped, water will be able to percolate through, and the worms will have bite-sized pieces to pull into the soil. We probably accelerated our composting cycle by a year or two. 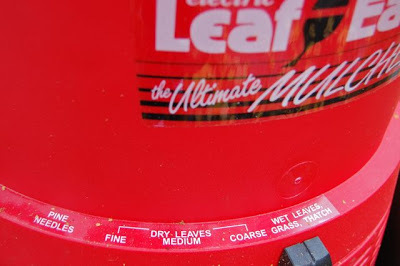 The Leaf Eater offers a range of settings selected by a slider that controls the flow in the hopper, from pine needles (finest/slowest) to wet leaves, grass and thatch (coarsest/fastest). As we’d had rain a day or so ago, we principally used the wet leaves setting. We made frequent use of the on/off switch during shredding, too, turning off the motor whenever possible. They recommend you use safety glasses, gloves and shoes. I’d also suggest wearing long pants and sleeves, even if using in summer, as small bits do occasionally fly out the vents and top. 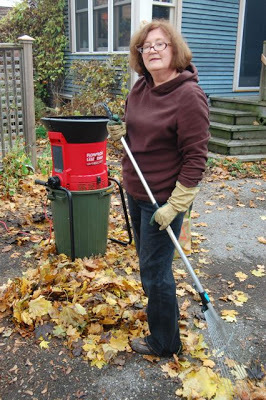 The Leaf Eater can be placed over a garbage can, as we did, and also has its own stand and an integrated bungee cord for attaching a garbage bag. When using a bag, the hopper can tilt on its stand for easier access. We found that feeding continuous small batches worked best, to let gravity do its work. I imagined being a miser, and feeling those dollar bills run through my fingers. Mine, all mine! Sometimes it helped to swirl the leaves at the widest part of the hopper top (like water going down a drain). We kept a yard bag nearby for twigs and branches. One review I read said that it didn’t respond well to twigs, but we found that the occasional one did slip in without serious consequences. Never reach your hands inside while the machine is running. An occasional shake helped loosen leaf jams. The wetter the leaves, the more they tended to clog. The holes above are shown at the largest setting, but it was surprising how finely the leaves were cut. To cut leaves more finely, which must be almost to a powder, they recommend you process them twice: once at coarse and once at a finer shred. I was quite satisfied with the coarse setting myself. In the image below, the larger leaves are mostly those left in the hopper at the end of the process. Deeper in the bin, the leaves are cut quite small. Dustiness seems to be one criticism I’ve read about. In fact, some writers recommend the use of a dust mask. In our case, this is an instance where the rain probably worked in our favour, keeping dust to a minimum. In drier weather, a mask might be welcome. One minor criticism is that the base of the stand did come apart as we moved the bin away on a few occasions. However, this might be simply due to improper assembly. It was certainly work. I retired to the tub with a book after our 2.5 hour stint. However, Sarah and I were impressed with how much (or how mulch) we achieved. In short, I’m pretty darned pleased. My sister and I spent a companionable afternoon in the garden, punctuated by cups of tea and conversation (when the Leaf Eater was napping). And we both have the satisfaction of having fed our gardens, and the worms who frequent them, with beaucoup, beaucoup delicious organic matter. And that’s what matters most to us. Now that machine would have any gardener feeling pretty content about having an abundance of leaves ! Great idea. It looks much more user friendly than mine. Pure gold for your gardens for sure! I almost purchased the Flowtron last year but finally decided to stick with my regular gas mower for leaf mulching. (I do have to find a use for it now that I've converted to a push reel for the grass). One comment I read on the site selling it said it wasn't worth the money and you could achieve the same results by weed-eating your leaves in a garbage bin. Well of course, I tried that out and although results were excellent, you'd need a pair of man arms to endure a prolonged session of any kind. It looks like a fine piece of equipment. Thx for the review. Do continue to be careful. DH poked the end of the rake into our gas-powered shredder to unclog it and it chewed off the end of the rake, lol. My fav leaf chewer is to just back the lawn mower over them. This is a fantastic machine, and It's really not as noisy as a leaf blower, in my opinion. While the leaves are actually being chopped the motor it is sort of muffled. When the leaves have gone through and the motor is running, it's noisier, but at that point you can just switch it off, while you go and get more leaves. The big difference between this and running the weedeater in a garbage pail is that gravity does the work for you. Not to mention you don't have to be holding up a heavy weed eater the whole time. Big difference between this and using a lawn mower is that all the leaf mulch is neatly collected in the garbage pail and you can carry it to wherever you want the mulch to go. It's quite a thrill to operate, and just fun toss in those leaves knowing they're going to be gold for the garden. Garden alchemy! Go Flowtron! Ooo.. potential new toy. How exciting! Love the look of this, it's just a question of where to store the thing as I'm supposed to be trying to downsize the shed. Oh, that sounds wonderful. Good for both of you. HI Helen: Good review, you should get a free shredder for that. I am sure if you let the manufacturer know about your post they will do some thing for you. Rosey, it's all about the leaves! Tina, It was surprisingly user-friendly. The instructions were even comprehensible. Miss M, It is essentially an upside-down weed whipper that controls the flow of the leaves past the whips. But often things that are ingenious are just simple common sense. I would have had to buy a weed whipper in order to do the garbage can thing, so for me this was money well spent. Nell Jean, My reel mower is so ancient, it barely cuts grass, never mind leaves. No gas or electic mower available — with so little lawn, it hasn't been worth the purchase. So, again, this worked for me. Dawn, It's light enough that it should be able to balance on top of things in our shed, which is only small to begin with. But our fall has been so mild, that not everything is in storage yet. My fingers are crossed that it'll all fit. Lorainne, I did see people using those vacuum things, and I guess they're a great idea. But it was very handy just to have everything land in the garbage bin. The diff. in weight between the wet leaves and dry leaves was significant. Mind you, you probably burn extra calories your way… I wouldn't mind burning a few myself! Gardening Express, I'm not sure whether they make different sizes. I'll have to check that out. Thanks, Stephanie — we feel pretty chuffed. Dee, It's always a mystery to us why people throw their leaves away, then spend money on mulch at the garden centre. My Vulcan blood says: Illogical. Frances, Sarah and I got a team thing going. One of us would rake the leaves close to the shredder, the other one would feed in the leaves. We moved the shredder around three times to get us closer to the action — it's very light and easy to carry. You'd need a long extension cord if you had a big yard, but I suppose if you own an electric mower you'd have that covered. Di, I've just asked Mr. TG to go and check the model number on the box he'd moved to recycling… and the envelope says: LE900CAN. Thanks, Andrea, I'll contact you via email. John, So far, I'm not the kind of blogger manufactures send free stuff to! This one came out of my pocket… though perhaps that was reason enough to be happy with my purchase. Still, I definitely was! Ms TG, thank you so much! 😉 We don't have a lawn, therefore, no mower/leaf mulcher, so this would be great. Loved the Austen quote, she is a fine observer of human nature, which hasn't changed much in 200 years. Liked the review and glad this leaf eater is such a success for you. One warning: noise levels over 90 db do cause permanent deafness, a little at a time. I'd be willing to bet this puppy is over 90 db (unless it's some marvelous new quiet technology), so let me be your mother for a mooment: wear ear protectors! Thirty bucks and looking stupid for a little while is SO worth keeping your hearing. Thank you so much for this very informative post. After raking leaves ALL weekend, it is inspiring me for next year (maybe they go on sale). 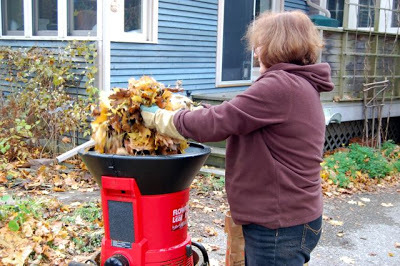 We couldn't fit all our leaves in our leaf composter and ended up using the mulching mower on some of them. I think I'll get a Flowtron. I cannot imagine why leaf shredders aren't more popular, especially in Toronto. 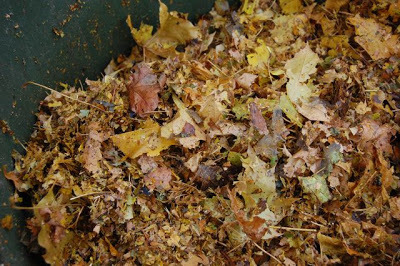 Now all you need to do is to get rid of what is producing the leaves–the dreaded Norway Maple. The Norway Maple on my lawn is slated for the chain saw; I am replacing it with a Bur Oak (native). I know I will need the shredder for those big oak leaves. Thanks for the useful review of the Flowtron–love the name! Just wanted you to know we got our Flowtron from Amazon last week; leaves are piled, but it's way too cold for us to be out there…. but SOON. Thanks. What’s that orange bug on your milkweed?